A heminephrectomy may be performed for a nonfunctioning kidney or for a renal mass. 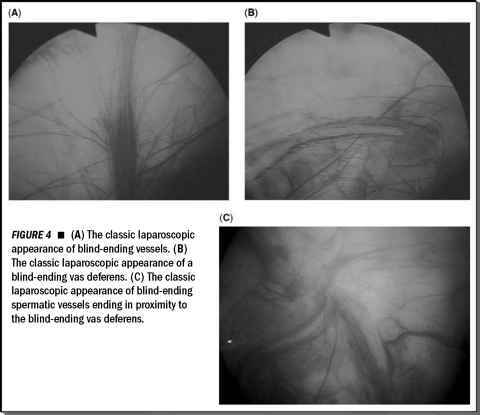 We will briefly describe an approach for laparoscopically managing a nonfunctioning moiety of a horseshoe kidney. We feel that for an atrophic kidney with minimal renal parenchyma, a planning angiogram is unnecessary. We prefer to decompress the collecting system at the time of the operation after the kidney is exposed. This avoids the possibility of adhesions resulting from percutaneous drain placement, and the distension of the collecting system facilitates the initial dissection. For a transperitoneal approach, the port placements are the same as for a laparoscopic pyeloplasty in a horseshoe kidney (Fig. 1). The colon is mobilized medially to expose the kidney. The ureter is identified and ligated between clips. The kidney and isthmus are mobilized and separated from the aorta. The hydronephrotic collecting system is decompressed under direct vision using a percutaneously placed spinal needle. The isthmus can be separated using electrocautery, ultrasonic shears, or an endoscopic stapler. Hemostasis can be achieved at the cut surface using a combination of argon-beam coagulation, manual compression, fibrin glue, thrombin, cellulose sheet, and intracorporeal sutures. Alternatively, the isthmus can be divided using an extracorpo-real approach as described above. Once the affected renal moiety is completely freed, it is placed in an entrapment bag and manually morcellated to allow removal through a 12-mm trocar site. When the surgery is being performed for suspected renal cell carcinoma, we feel that the specimen should be extracted intact, using an entrapment bag. A small midline or Pfannenstiel incision can be made. The colon should be repositioned after specimen removal. Laparoscopic heminephrectomy can be performed using a transperitoneal or a retroperitoneal approach, depending on the preference of the surgeon. When performing a heminephrectomy for a hydronephrotic, nonfunctioning moiety, the isthmus can be divided extracorporeally.